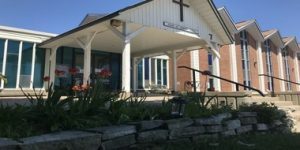 The Parish of St. Michael and all Angels began after a meeting held in Bel Air Public School on September 21, 1961, when 61 couples from Ridgeview, Parkway Park, Kenson Park, Bel Air Heights and Copeland Park subdivisions of Ottawa met with: Rt. Rev. E. S. Reed, Bishop of Ottawa; the Rural Dean; and the Rectors and Assistant Curates of St. Martin’s and St. Richard’s Parishes. The purpose of the meeting was to discuss the possibility of founding an Anglican Parish in the area roughly bounded- by the Queensway on the North, Baseline Road on the South, Copeland Park, and Ridgeview subdivisions to the East and West respectively. Subsequently, the Bishop appointed the Rev. J. F. Plant as “Bishop’s “Missionary” to serve in the Parish commencing October 16th, 1961. The formative Vestry Meeting of the-Parish was held on October 29th, 1961. At this meeting permission was granted to purchase a house suitable for use as a Rectory. A house located at 1124 Field Street was purchased and soon after the basement of the house was altered and equipped to be used as a Chapel and an office. In April 1962, the Reverend J. F. Plant resigned as Incumbent of the Parish and the Bishop then appointed the Reverend E. K. Clarke, Diocesan Director of Christian Education, to act as Priest in Charge, who served in this capacity until April 1963. The Bishop then appointed the Reverend E. K. Lackey of the Parish of Vankleek Hill to be Rector beginning April 1st, 1963. In November 1965 the parish rejected a site purchased earlier by the Diocese…Subsequently, an alternate site on Bel Air Dr. was chosen and subsequently purchased from the National Capital Commission. When the congregation first began to think about the design for the new Church, the following definition of a church building was formulated: A Church building should be a place where God’s family can gather for worship as closely as possible around the Altar. In the design of this Church, Mr. Edward Cuhaci caught the spirit of this definition in the layout of the pews, the spaciousness of the Altar area, and the general feeling of freedom in and around the building. A Special Vestry Meeting, held on June 9, 1964 approved the concept and design of the-new Church, as presented by Mr. Edward Cuhaci, the architect selected by the Parish. In October 1964, the congregation contracted the W. R. Bourne Construction Company to build the Church building. On the Festival of St. Michael and All Angels, (September 29th, 1964) the first sod for the new Church was turned by Bishop Reed, assisted by Archdeacon Osborne, the Reverend J. C. Garrett (St. Richard’s Church), the Reverend D. M. G. Thomson (St. Martin’s Church), the Reverend E. S. Davis (St. Stephen’s Church), the Reverend E. K. Lackey, the Reverend E. K. Clarke (Honorary Assistant at St. Michael and All Angels), Mr. Garnet Smith, Rector’s Warden, Mr. D. V. Hamilton, People’s Warden, Mr. Edward Cuhaci, Architect, and Mr. H. B. Mersereau, Chairman of the Building Committee, along with a great number of friends and neighbours of the Parish. The construction of the Church began in October 1964 and the first Service was held in the new Church on September 26, 1965. The church was dedicated on December 21,1965. The building was consecrated on December, 1990, when the mortgage was burned. After a two year process of discernment and discussion members of the parish overwhelmingly voted amalgamate with St. Richard’s to form the new parish. The new parish of Julian of Norwich was formed on September 25, 2017, and took up residence in the buildings previously occupied by St. Richard’s. The following clergy have served as Rector of St. Michael’s: Rev. J. F. Plant; Rev. E. K. Clarke; Rev. Ed. K. Lackey; Rev. Cameron Cairns; Rev. Jim Ibbott; Rev. John Blakely; Rev. Linda Privitera; Rev. Alan Box; and Ven. Mary Ellen Berry.